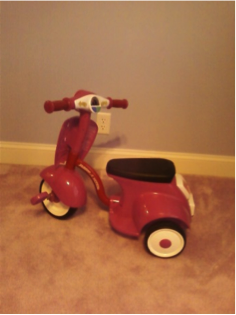 The Radio Flyer Tot Scooter comes equipped with flashing/clicking blinkers. Included features in this crafty-tot-vehicle include recorded tunes and sounds, a horn, flashing/clicking blinkers and, a secret storage unit under the seat. Of all the exciting features on this mobile toy machine, brakes are not included. Our three-year old grandson loves to pedal his way around our house on his red scooter…whizzing past most obstacles along the way. Oswald Chambers in his devotional book titled, “My Utmost For His Highest,” compares our state of mind in making decisions …to having “reasonable blinkers.” Reasonable blinkers that indicate we are about to change the direction we are going in. Rational thinking/reasoning that becomes the substitute for blind faith in our walk with the Lord. This substitute for trusting God often leads us off the direct path that our heavenly Father has planned for us (Jeremiah 29:11). Throughout the Bible God’s word continually instructs us to follow Christ; trust in the Lord…not our understanding…or lack of (Proverbs 3:5-7); recognize there is a way that seems right but is instead destructive (Proverbs 14:12); commit our way to the Lord…realizing He will direct us (Proverbs 16:3); and when needing wisdom or direction…ask in faith believing He will provide it for us (James 1:5-8). Whether the reasonable blinkers we engage have flashing lights (obvious to others,) a clicking sound (making our intent obvious to us,) or silent…unrecognizable to all but God…using reason to respond to a situation in place of faith will result in further confusion and often the wrong choice. Prayer: Father of all wisdom and truth, forgive us for the times we try to determine the best path to take, using our own reasoning instead of faithfully seeking your wisdom and direction.